Can you tell me the process to sign up/register for pH Test on the official website of eLitmus? Provide me the contact detail of the office of eLitmus? 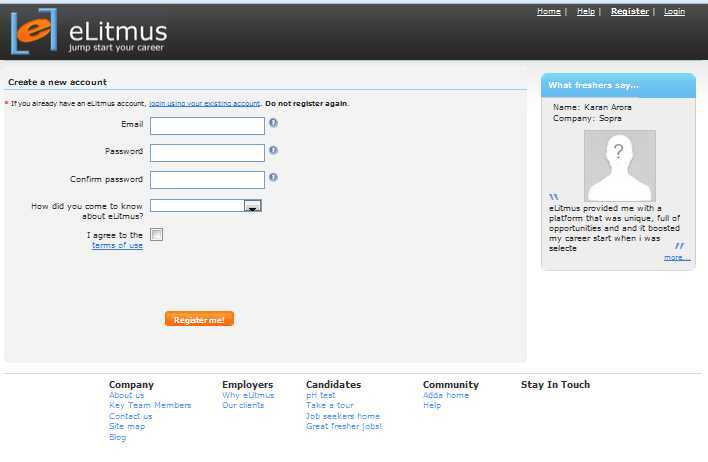 eLitmus was launched in 2005 and has been redefining how fresher and entry-level recruitment is done in India. Its pH Test evaluates job seekers based on a variety of parameters, and grades them nationwide using an advanced statistical model, resulting in a pH Score for each candidate. For recruiters, it provide a way to reach out to candidates from across India, any time of the year, using standardized evaluation criteria - all without any of the attendant logistical hassles, and with tremendous savings in cost and effort. For job-seekers, it provide a one-stop-shop where they have access to dozens of employers from across the country, based on a completely objective and standardized score, dramatically improving their chances of finding that right first job, with much less effort.